1. Submit your application for an EIN. An EIN is an employer identification number assigned by the IRS. It is used to identify a tax account of employers and others who might not have employees. It’s used to identify taxpayers. The application process and approval is usually instantaneous. An S corporation (sometimes referred to as an S Corp) is a special type of corporationcreated through an IRS tax election. An eligible domestic corporation can avoid double taxation (once to the corporation and again to the shareholders) by electing to be treated as an S corporation. S-Corporation is the same as a corporation, but has some additional tax benefits than a Corporation. An S corporation must elect to be taxed as a S corporation by submitting the IRS Form 2553. With an S corporation, you have to file your annual corporate tax return on the IRS Form 1120-S instead of Form 1120 which is for the classical Corporation. However, income and losses are passed through to shareholders and are included on the individual's tax returns. Therefore, there is only one federal tax to pay. 2. 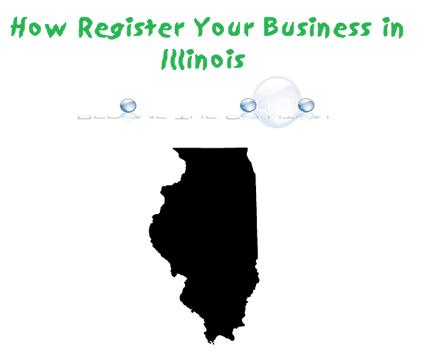 Register with Illinois Department of Revenue. Complete the online application through MyTaxIllinois. The process will complete in 1 or 2 days. 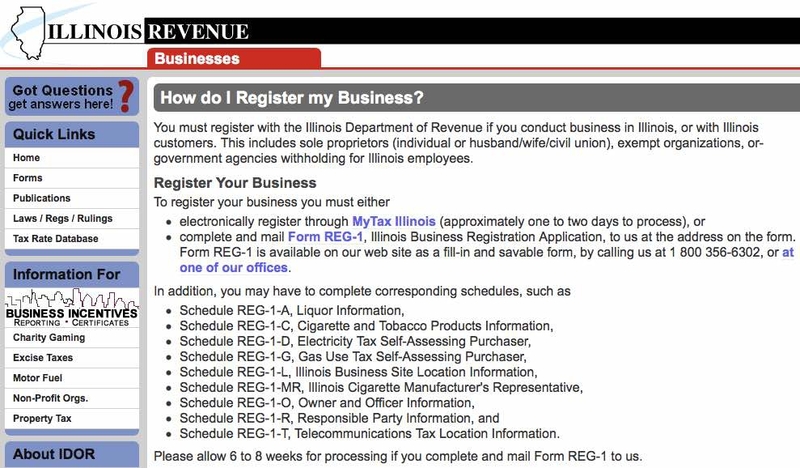 You must register with the Illinois Department of Revenue if you conduct business in Illinois, or with Illinois customers. This includes sole proprietors (individual or husband/wife/civil union), exempt organizations, or-government agencies withholding for Illinois employees. 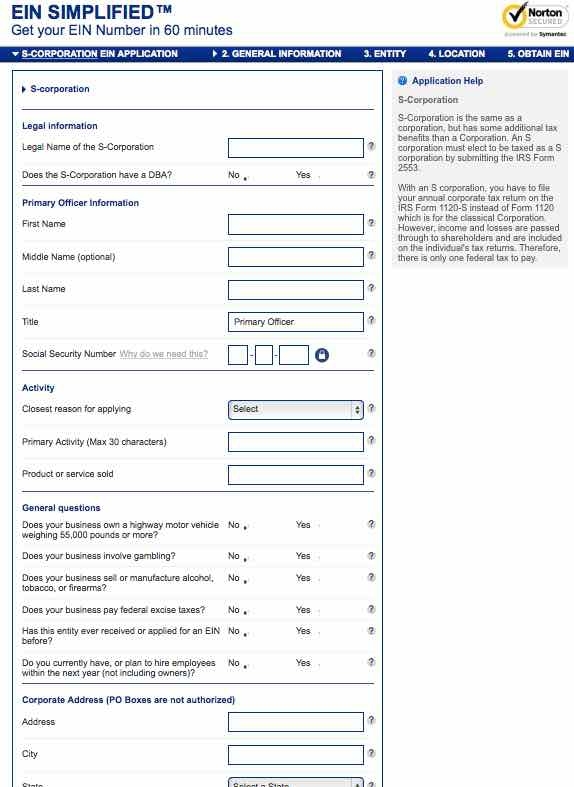 Register using one of the above methods, before you make any purchases, sales, or when you hire an employee. You must display your Certificate of Registration in a prominent location in the place of business to which it applies. 3. Get your Articles of Incorporation. CORPORATION NAME: The corporate name must include one of the following words or abbreviations: Corporation, Company, Incorporated, Limited, Corp., Co., Inc. or Ltd.. REGISTERED AGENT: The corporation must appoint a registered agent who has a business address within the State of Illinois. A Post Office Box cannot be the registered address. STOCK: All corporations filed on-line will have only one class of stock, which will be named "Common Stock". The number of shares of common stock to be authorized must be set forth along with the number of shares of common stock proposed to be issued without further report to the Secretary of State. The monetary consideration to be received by the corporation in exchange for the shares of common stock proposed to be issued must also be set forth. PURPOSE: All corporations filed on-line will have the following purpose: "The transaction of any or all lawful purposes for which corporations may be incorporated under the Illinois Business Corporation Act." Professional corporations, Medical corporations, Close corporations or business corporations with a specific purpose cannot be filed on-line. INCORPORATOR: The incorporator must be a natural person aged 18 years or more. 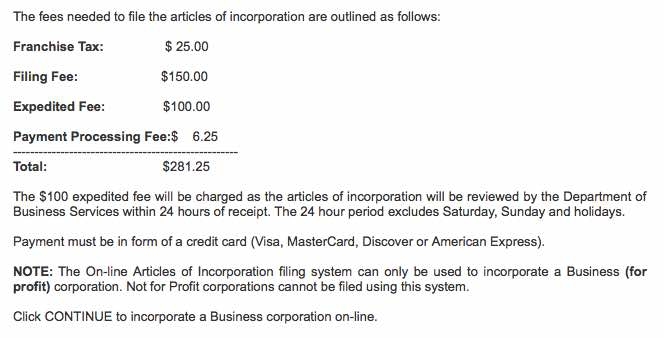 The fees needed to file the articles of incorporation are outlined as follows.